Kay Marie Fisk, 61, of 102 2nd Street passed away on Thursday, November 02, 2017 at Olean General Hospital following a lengthy illness. She was born October 29, 1956 in Wellsville, the daughter of the Frederick and Loretta (Aldrich) Baumgarten. On November 8, 1987 she married Greg Fisk who survives. 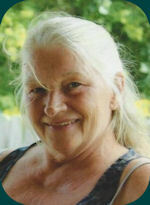 Kay was a loving wife, mother and grandmother who loved spending time with grandkids and family. She had a VERY special love for her dog “LUCY”!! She was employed at Heritage Cutlery in Bolivar for 23 years. Surviving in addition to her husband Greg, are two sons, Coddie (Meredith) Bissell and Dusty Bissell both of Bolivar, two daughters, Bambi (Shawn) Perry of Bolivar, and Heather (Richard) Clark of Virginia, 11 beloved grandkids, three sisters, Connie Zeager of Cuba, Nancy Baldwin of Richburg, Billie Jo Brownell of Bolivar, as well as several nieces and nephews. She was predeceased by a brother, Frederick Baumgarten Jr. Family and Friends are welcome to join us for a celebration of life, on Sunday, November 5, 2017, from 3:00 to 5:00 pm at the Bolivar Legion. Mari Lou Lall, 60, of 2609 Hallsport Road, passed away unexpectedly in Jones Memorial Hospital on Friday (Sept. 29, 2017). 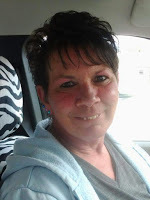 She was born in Wellsville on Nov. 5, 1956, the daughter of Roy R. and Anna I. Fanton Brown, Jr. A lifelong resident of the Wellsville area, she was a graduate of the Wellsville High School. She enjoyed her cats, being on the computer and her Native Indian Festive studies. She is survived by a daughter, Dr. Shelly C. (Jonathan C. Pawlak) Lall of Sutton Bay, MI; her mother, Anna F. Brown of Wellsville; and a sister, Joann Ives of Wellsville. She was predeceased by her father, Roy Brown, Jr.; brother, Rev. Roy Brown, III. Friends called at the Mulholland-Crowell Funeral Home on Monday (Oct. 2, 2017) from 10 until noon, when services were held. Pastor Gene Miller of the Yorks Corners Mennonite Church officiated. Burial followed in the Hallsport Union Cemetery. Memorials may be made to the SPCA Serving Allegany County or to a local charity of the donor’s choice. Mark J. Schoenherr, 57, of 8 Meadowbrook Court passed away on Monday, July 14, 2014 at the Hart Comfort House following a battle with cancer. He was born October 28, 1956 in Wellsville, the son of the late Karl J. and Patricia (Wall) Schoenherr. Mark was a 1971graduate of the Immaculate Conception School and a 1975 graduate of Archbishop Walsh High School in Olean. He attended Herkimer County Community College and was a 1987 graduate of Buffalo State College. He was employed at a number of restaurants in Wellsville and Olean, beginning with Pizza Hut and most recently for many years, at the Texas Hot in Wellsville. Mark was an avid Buffalo Bills and Sabres fan and loved watching NASCAR and Notre Dame Football. He was a life member of the NRA, the Sons of the American Legion Post 702, and the Wellsville Volunteer Ambulance Corps and Rescue Squad. He was a former member of the Emerald Hook & Ladder Company # 3 and the Willing Volunteer Fire Department. He is survived by three stepchildren, Ben Grover of Scio, Kelly Ertell of Cuba and Heather Bennett of Allegany, 12 grandchildren and a host of close friends. In addition to his parents, he was predeceased by a grandson, Cameron Fenti in 2012 and several aunts & uncles. 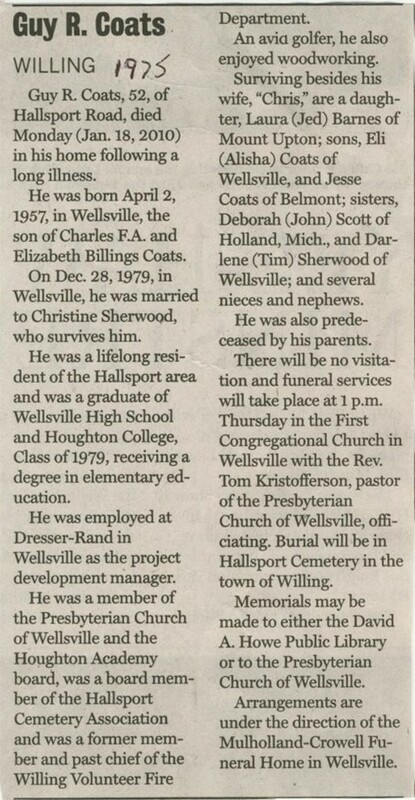 Friends are invited to a graveside service on Tuesday, July 22, 2014 at 4:00 pm in Sacred Heart Cemetery, 300 South Main Street in Wellsville. The family suggests memorial donations be made to the Wellsville Volunteer Ambulance Corps, the Hart Comfort House or Lollypop Farm – Humane Society of Greater Rochester, 99 Victor Road, Fairport, NY 14450. To leave online condolences, please visit www.embserfuneralhome.com.